“Amazing Debi” revolves around the author Debi Harmon Ference, who at the age of 18 months started having seizures due to a high fever and whooping cough. On the way to the hospital over 60 miles away she slipped into a coma and doctors felt she wouldn’t live or would have brain damage. Over the course of years, she would be tested for the causes and monitored closely. One can only imagine what it is like for a small child to sit in a doctor’s waiting room looking at other children who wore helmets to protect themselves due to the intensity of their seizures. The author relates that seizures are caused by abnormal electrical activity in the brain. Because communication between brain cells involves electricity, a small electrical abnormality can cause dysfunction. She also relates that when specific medical issues like brain tumors, brain damage and infections often the area involved in seizures can be identified. She also notes that much of the time an underlying cause cannot be identified. The author goes on to describe briefly spasm seizures, seizures when a person freezes for a short time and when “auras” occur. Auras are a sensation that one experiences which indicate a seizure is about to occur. When she was in fifth grade, Debi had a seizure in class where she lost control of her bladder. Amazingly, to me at least, her parents never talked to her teachers about her seizures or how to handle them. However, given the year, that was something people knew little about or discussed. Debi’s biggest fear was she would be seen as a freak or bullied. 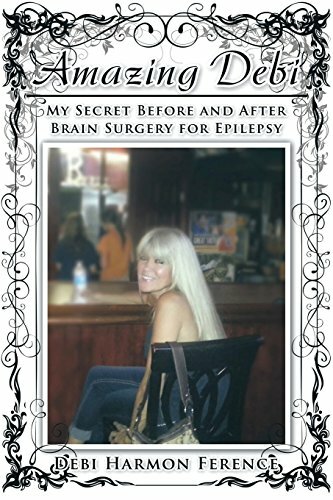 Throughout the years the author kept her epilepsy a secret, and if any occurred, she stated she had a brain tumor. She was not able to keep any relationships as she would not reveal her secret. On December 29, 1995, she had brain surgery to eliminate her seizures. While “Amazing Debi” has potential in being a very informative and supportive book on seizures, several areas left me quite disappointed. There was no indication of the support (medically and socially) from her parents; all support seemed to come from her sister Kyiana. I found the overall writing in “Amazing Debi” to read at a novice level and the undertones of a “poor me” type attitude took me out of the story. While many people have epilepsy, they do not take this stance. I did not feel the book met the author’s intent as it was very general and did not provide any suggestions on where to go for support groups or recommendations on living with epilepsy, etc. If some of this information had been provided I feel like it would be more beneficial to others going through the same thing. As it stands, without this information I would not highly recommend “Amazing Debi” by Debi Harmon Ference.